The last of group X’s games was hosted this weekend by Devon Clotted Screamers at North Devon Leisure Centre, Barnstaple. The event was named Scream Tea and Screams there were a plenty along with proper scones, cream and jam – of course how you ate them was up to you, but the real way is with the cream first!!! People in tea dresses and announced by the Mad Hatteress!! Afternoon tea never tasted so good and mixed with Roller Derby what could be a more perfect afternoon! The hosts with only 11 started proceedings playing against Bristol Roller Derby B Team with only 9 in their team and what a game, very close throughout keeping everyone on the edge of their seats. Jam 5 saw the scores at 35:34 and at half time the scores were 141 to Bristol and 126 to Devon Clotted Screamers. The second half remained close again and ended in a 306 to Bristol whilst just 39 points behind were the Screamers! The game also saw 2 foul outs in the second half from Bristol. The last game of the day saw Dorset who had been undefeated take on Plymouth B who had everything to play for to get to the semi-final. This fast paced game saw 22 jams in the first half and at half time the scores were 138:32 to Dorset. The second half continued at the fast pace and the final score was 306:80. Dorset meet Plymouth’s A team in the Heartlands series this coming weekend (Saturday 5th July) in Dorset – see www.heartlandseries.co.uk for more information. The day was finished with piñatas in the shape of a teapot and teacup being smashed and revealing many exciting treats for the kids and adults alike! A great day had by all. So the final of the SW League– Gladiskaters, The Ultimate Battle – takes place on Sunday 20th July at Westpoint Area, Exeter EX5 1DH with the doors opening at 11am. 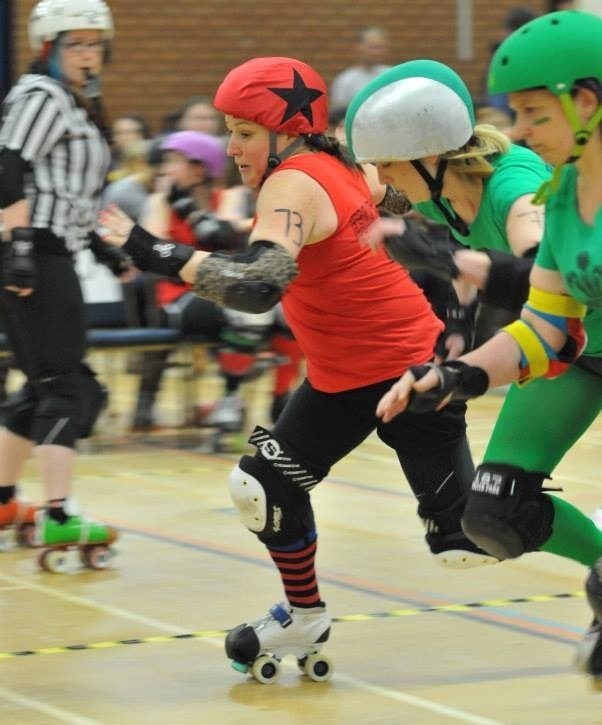 The semi-final bout for 3rd and 4th places will see Cornwall Roller Derby take on Bristol Roller Derby B Team whilst the final will see the hosts and last years champions, SWAT take on Dorset. SWAT and Dorset have both been undefeated in this league so this really will be The Ultimate Battle for the title of Champions in the South West League 2014. Don’t miss it!!! Tickets are available from www.southwestangelsofterror.com.